GIGABYTE are perhaps best known for their range of motherboards but are rapidly becoming a firm favourite for that other essential PC component, the graphics card. With the advent of their Windforce cooling a few generations back, GIGABYTE are up there competing with the very best thanks to huge support and adoration of PC enthusiasts and overclockers alike. The G1 gaming (formally Super Overclock) range makes use of a innovative feature called GPU Guantlet which GIGABYTE say guarantees higher overclocking capability in terms of excellent power switching - a feature we will be putting to the test later in this review. So we have a custom PCB, custom cooling along with one of the fastest factory overclocks found on NVIDIA's GTX 970 (BASE: 1178 MHz / BOOST: 1329 MHz). All this at a reasonable £289.99. 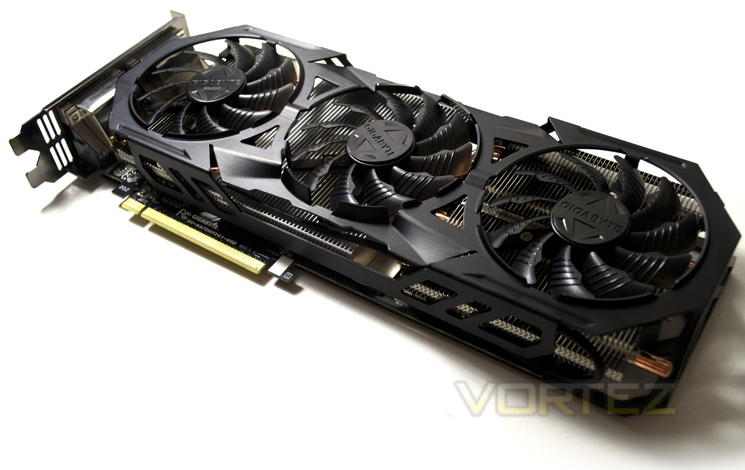 We were critical of the last GTX 970 we reviewed because of a £300 price tag and while this is a little cheaper, it is still at a similar level to a custom cooled and faster flagship card from AMD, the R9-290X so it will be interesting to see if the overclock applied to this model has closed the gap. We believe that at this level of the market speed isn't everything however it has to be said that if it is not as fast then it needs to dominate in every other feature because if it doesn't speed vs cost will likely be the deciding factor. That is unless you are looking through green tinted glasses (brand loyalty). At this price point, the biggest draw to consumers is raw performance and by that we do mean FPS/benchmark scores. There may be people in this world who can't tell the difference between 75fps and 150fps yet those very same people will still buy a stupidly fast GPU to run at 1080p resolutions when there is no perceived need. Why do they do this? We would wage for a few reasons. Perhaps it is because 2 years down the line when the next Crysis 5, Half Life 3 etc is released or for when they upgrade their screens and therefore resolutions, they want to know their cards can run it. Perhaps they like knowing they got the best they could afford? In short it doesn't matter if there is only 1 fps or 10 fps between two cards, consumers will want the faster card, or at least the fastest card they can get for the money. To state otherwise just doesn't make any sense. Of course it is not the ONLY feature to look at when considering the purchase of a graphics card, if it were then companies such as GIGABYTE, ASUS, MSI et al wouldn't put so much effort into near silent cooling, which is why we try to cover all elements in our reviews but at this level, cooling, noise, power efficiency and looks will always come second to performance and then cost. A balanced card is no bad thing but being top heavy on performance is certainly the main priority when spending close to £300 on a component.